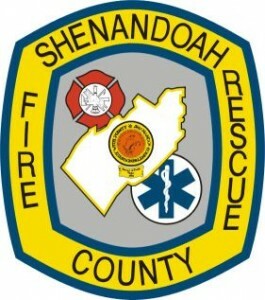 Woodstock, VA- The Shenandoah County Department of Fire and Rescue announces a fatality as a result of drowning. On Thursday, February 25 at approximately 9:00 a.m. Shenandoah County Fire and Rescue crews were dispatched following reports of a car being swept into the North Fork of the Shenandoah River, while attempting to cross the Artz Road bridge, located north of Woodstock. A female in her late 70s was attempting to cross the low-water bridge, while traveling west when the car went off the bridge. The vehicle was located approximately half a mile downstream, submerged. There are no known passengers who were with the driver. A deceased victim was located late this afternoon several miles downstream from the location of the submerged vehicle. The victim’s identity is being withheld pending positive identification by Office of the Medical Examiner and notification of family. Swift water rescue companies from Orkney Springs, Strasburg, and Frederick County in addition to fire and rescue companies from Woodstock, Toms Brook, and Shenandoah County responded to the scene. Resources from the Shenandoah County Sheriff’s Office, Virginia State Police, Virginia Department of Transportation, and AirCare cooperated in the search and rescue operations. Shenandoah County Department of Fire and Rescue reminds every one of the importance of avoiding driving across roads that are submerged in standing or flowing water. Just before midnight on Friday, Sept. 18, fire and rescue units from central and northern Shenandoah County responded to a structure fire at 98 Wood Park Lane, just north of Woodstock. Callers to 911 reported one person trapped inside the structure. The first companies to arrive found a trailer home in flames, with fire spreading to trailers on each side at 94 Wood Park Lane and 102 Wood Park Lane. Firefighters verified that there was a trapped occupant but extreme fire conditions kept them from making a rescue. Officials later confirmed one adult male fatality. Firefighters were able to quickly confirm that two other occupants of the home, an adult female and one child, escaped with no injuries. Investigation by the Shenandoah County Fire Marshal’s office and the Shenandoah County Sheriff’s Department suggests that the origin of the fire was near the clothes dryer, as reported by the female occupant. She said that they have been experiencing electrical problems with the dryer for some time. Interviews with witnesses indicate that the deceased was not in the home at the time, and arrived thinking the female and child were still in the trailer. Witnesses say he entered the burning structure to rescue them and was unable to escape. A neighbor, an adult male, also entered the burning structure to assist with the rescue attempt and sustained burn injuries. The neighbor was transported to Shenandoah Memorial Hospital where he was treated and released. The investigation indicates that both the deceased and the neighbor were unaware that the adult female and child had escaped the burning home. The American Red Cross is providing shelter to both of the adult and the child. The trailer at 98 Wood Park Lane was totally destroyed. The neighboring trailer at 102 Wood Park Lane sustained damage, and three adults and two children have been displaced from that trailer. The Red Cross is also taking care of sheltering them and addressing their immediate family needs. The trailer at 94 Wood Park Lane was unoccupied. Investigators canvassing the neighborhood for witnesses got additional reports from residents of the trailer park of electrical problems, and the County Building official condemned one other home at 75 Wood Park Lane until maintenance violations are corrected. Occupants of this home are being sheltered by Social Services. All Fire and EMS units left the scene around 2:45 Saturday morning. The Fire Marshal’s office stayed at the scene throughout the night to continue the investigation. 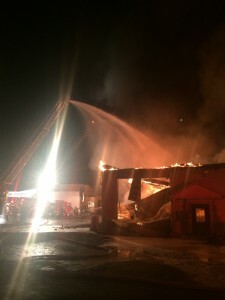 The response from central and northern battalion companies of Shenandoah County Department of Fire and Rescue included engine companies from Woodstock Fire Department, Edinburg Volunteer Fire Company, Toms Brook Volunteer Fire Department and Strasburg Fire Department and a ladder truck from Woodstock Fire Department. EMS units came from Woodstock Rescue Squad, Shenandoah County Department of Fire and Rescue and Strasburg Rescue Squad. EDINBURG – Firefighters responded to a fire at Wholesome Foods at 986 South Ox Road near Edinburg on Wednesday night, Jan. 14. No employees were injured in the fire, but one firefighter suffered a minor injury and was taken to the hospital. 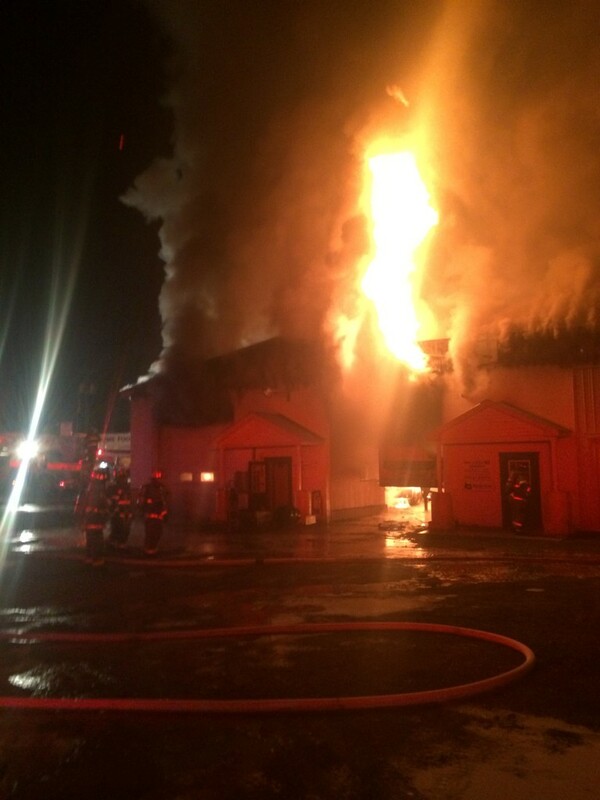 The call was dispatched at 8:24 p.m. and Edinburg firefighters found heavy fire in the auto shop section of the Wholesome Foods complex. Their immediate goal was to keep the fire from spreading. Adjacent to the burning building were some nearby tanks that contained several thousand gallons of gasoline and diesel fuel. Also nearby were additional buildings. The fire was contained to the one building. The facility is located outside of Edinburg and did not have fire hydrants. Additional tankers were dispatched to help, and fire engines and tanker trucks hauled water to the scene, filling up at three hydrants along Stoney Creek Boulevard in the town of Edinburg. In all, they carrried about 91,000 gallons of water to the fire scene. Fire crews remained on the scene until after 1 a.m. on Thursday, Jan. 15, and the building was expected to continue smoldering. The Shenandoah County Fire Marshal has begun an investigation into the cause of the fire. Everything so far points to the fire being an accidental fire, according to Fire Marshal David Ferguson. His investigation will continue when he can access the building, which has unstable walls and hot spots in the debris. Responding to the fire were units from Edinburg Volunteer Fire Company, Mount Jackson Rescue and Fire Company, Woodstock Fire Department, Conicville Volunteer Fire Department, Toms Brook Volunteer Fire Department, Strasburg Fire Department, Orkney Springs Fire and Rescue Inc., Woodstock Volunteer Rescue Squad, Strasburg Volunteer Rescue Squad, and Shenandoah County Department of Fire and Rescue. Deputies from the Shenandoah County Sheriff’s Office provided traffic control. WOODSTOCK–An 84-year-old female suffered burn injuries in a momentary “flash fire” at her home on the morning of Dec. 24. Around 8:35 a.m., the Shenandoah County Department of Emergency Communications received a medical alert activation from 41 Saumsville Road south of Maurertown. When 911 dispatchers called back, the resident told them she’d been burned while preparing to cook on her kitchen stove. Responders found the woman in the house, awake and oriented at the kitchen table. She told them that she had been preparing to cook on the gas stove. When she turned it on, it didn’t light until later when there was a flash fire, which caught the woman’s clothing on fire. Emergency medical units requested a helicopter to fly the woman to the hospital, but none were available due to weather. As a result, the ambulance took the woman to Rockingham Memorial Hospital. Her burns resulted in serious injuries. The Shenandoah County Fire Marshal’s investigation determined the fire as accidental with the cause coming from the operation of the gas stove that resulted in a flash fire. There was no significant fire or smoke damage to the house. Fire and rescue crews responded from Woodstock Fire Department, Toms Brook Volunteer Fire Department, Strasburg Fire Department, Mount Jackson Rescue and Fire Department, and Shenandoah County Department of Fire and Rescue.